52 Week High - What Does It Mean? 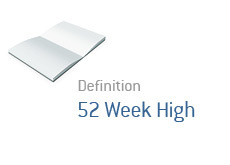 What does a "52 week high" mean? What is the definition of the term "52 week high"? "52-week high" is the highest price that a stock has traded at over the past 52 weeks. According to our Wells Fargo quote page, the stock is currently trading at $33.01 and has a 52 week high of $34.25. This simply means that the highest price that WFC (Wells Fargo) has traded at over the past 52 weeks is $34.25. The opposite of "52 week high", of course, is the "52 week low". This is the lowest that a stock has traded at over the past 52 weeks. Is Carl Icahn Liquidating His Stake in Herbalife?